Lunch at Izela, Kayaköy. There’s a first time for everything, even if that first time has been a long time coming. If you know the Fethiye area and you’ve been to the village of Kayaköy, chances are, you know Izela Restaurant. Chances are, you’ve eaten there on more than one occasion, actually. Because Izela Restaurant is a popular place. We know that. We’d just never been. But you know when you have those moments; those, ‘let’s do something new or a bit different to the norm,’ moments? That’s what one of our recent weekends was like. That urge to just go out and make the most of the spring weather. We decided to hop on the dolmuş to Kayaköy (we hadn’t been to the village in some time), have some lunch and then walk through the ruins over to Cold Water Bay (we hadn’t been to Cold Water Bay in some time, either). Wow, aren’t we the radical ones, taking ourselves off to a restaurant so many thousands of others have dared to visit before us. We’d been friends with one of the owners, Rebecca, for a long time on Facebook and knew she was around. (She and chef husband, Tolga, have built Izela up from scratch since 2004). Now seemed like the perfect time to venture forth into the unknown and go and say hello…and hope that lunch would be tasty! It’s a winding road that leads you to Izela. We followed the signs and soon found ourselves in a cool, shaded garden restaurant. Trees; tall, leafy pot plants, a mix of garden furniture – dining area, quiet seating areas tucked into corners, köşk for even more relaxation. In places, the shade is dappled by trees. Umbrellas protect the more sunny areas. We were eating so we opted for a dining table but the first thing we both noticed was the coolness of the gentle breeze. Yes it was only springtime but we immediately earmarked Izela for some summer visits. Sure we’d have no problems in whiling away a bit of time in the Izela garden, away from the summer heat of Fethiye centre. A bit of food, a few drinks, chats… Yeah, we can do that. Anyway, we were here for lunch. Time to eat. We were handed the Izela lunchtime menu. Happily, there are a good few places in the Fethiye area, these days, that have opted for the less-is-more approach. A good-sized menu with lots of choices…but not overwhelming. And great to see standout phrases on there; ‘organic,’ ‘homemade,’ ‘locally farmed.’ A thoughtfully prepared snack menu and now we were excited about what was to come. And how about this for a lunchtime snack. If you know us, you know we love sucuklu yumurta and we’ve always seen it served in the same way. Barry ordered the sucuklu yumurta at Izela and took delivery of this creation. Lovely to see a fresh approach to a Turkish classic dish. Toasted bread with the sliced sucuk laid on top. 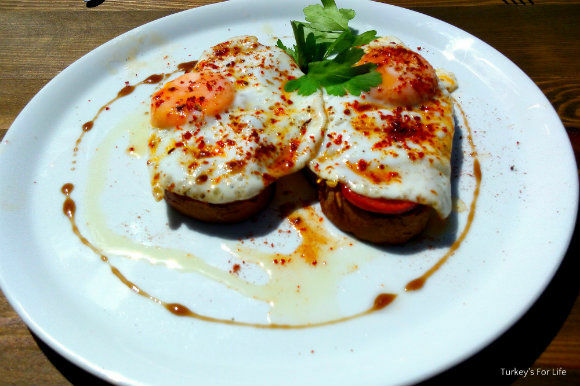 The fried eggs were placed on top of the sucuk, and, as you can see, well spiced. Big thumbs up from Barry! As for me, I always tell myself I’ll go for a light option but then see choices on the menu that mention things like ‘served with homemade chips’ and all intentions of light eating – well, it’s like they never existed. What happened to the light lunch? I went for the Mexican steak wrap. 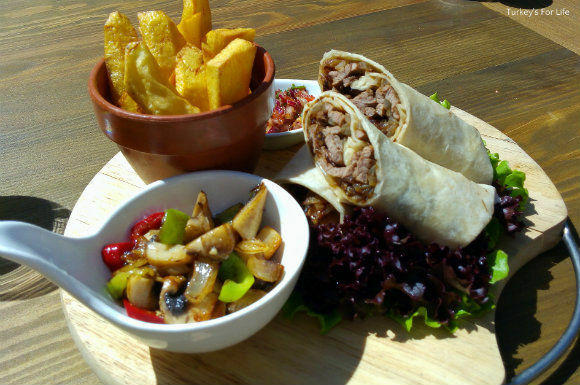 Oodles of juicy, tender steak chunks wrapped in lavaş bread and served with said homemade chips, sauteed onions, peppers and mushrooms and a salsa dip (a mild ezme). You can’t really see in this photo but the steak wrap is not just the two pieces you can see looking at you. There’s another one underneath. Wow, was I going to be well fuelled for our little wander, afterwards! I’d love to tell you I couldn’t finish it all…but I finished it all! I’ve had a good few beef/steak wraps in my time whilst living in Fethiye and it’s always a risk. They can be hit and miss. Lots of salad and hardly any meat. Or the meat is fatty or tough. None of that on this occasion at Izela Restaurant. As you can see, the lavaş was tightly packed with ample steak. Very much a personal thing but I’m even going to go so far as to say, to date, this is the best steak wrap I’ve had… Hmm, bold statement. Lunch was a (delicious) leisurely affair. It was washed down with a couple of drinks. We chatted with the family and with the staff, had a look through the evening a la carte menu. Again, extensive but not overwhelming. A few Turkish favourites but also other dishes that you don’t really see elsewhere. Another well thought out menu with more than a few dishes on there to catch our eye. In the indoor part of Izela Restaurant, you can see the wines on offer. As well as wine with your meal, if you’re a cheese and wine fan, you can have a cheeseboard, too. The restaurant is also famous for its organic Turkish breakfast if you’re fancying a leisurely feast with the ruins of Kayaköy as a backdrop. Izela is the public restaurant where you dine and chill. If you want to sleep, well you can do that, too. But you might be wise to book in advance, especially in high season. If Izela Restaurant has a loyal army of regular diners, Günay’s Garden is equally popular with residential guests – and, after we had a look around, it’s not difficult to see why. There’s a handful of hotel rooms at Günay’s Garden. Individually decroated, bright and spacious. Some are adjoining so that, if you’re a family or group, you can still have your own space. Don’t worry about noise – these rooms are soundproofed. They’re the sort of rooms that make you crave a stayover in Kayaköy. And then there’s the self catering villas. The one we looked around, we just fell in love with. 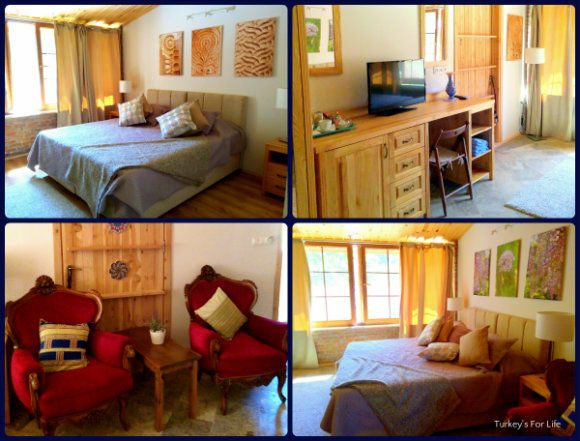 Completely our style of decoration, and, for self catering holiday accommodation, lots of room, too. The villas are fully-equipped and there’s a second bedroom to the villa in the photo above, too. What’s great about the accommodation is the enormous terraces that you have to yourself. We’re not talking space for a table and chairs, here. You get your table and chairs, sun loungers and sofa seating. With all of this comes vistas of the hillside ruins through the trees and a swimming pool. 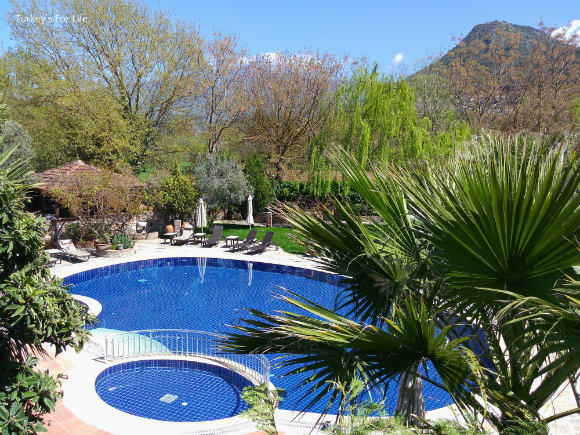 The bad news for diners at Izela is that the pool is only open to residents of Günay’s Garden. The fabulous news for residents of Günay’s Garden is that this pool is for use by residents only. Your own private space. Both Izela and Günay’s Garden are in the heart of Kayaköy, overlooking the ruins. The restaurant and accommodation are open throughout the summer season for breakfast, lunch and dinner. They hold events throughout summer such as wine tasting and theme nights. Izela have a pick up and drop off service to and from your accommodation in nearby areas. If you are getting married, it is possible to arrange your wedding at Izela and Günay’s Garden. For more information about all of this, other services on offer and photos, keep yourself up to date by checking their Facebook page, regularly. You can also visit their website. 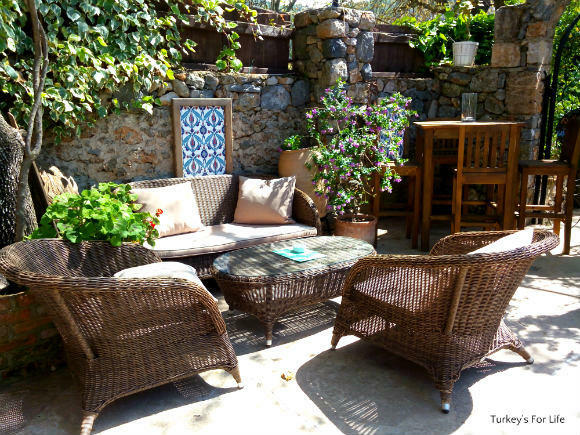 Izela has been added to our every growing list of places where we love to eat and drink around Fethiye. I haven’t been here at all. Your beef wrap does look lovely. Even if I think I won’t be able to finish my meal when I first see it I usually manage to polish it off. I am a chip freak as well.